When the adhesive has set for 24 hours, remove the spacers between the tiles. 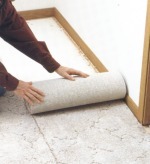 Use a grout float to apply the grout, force it down the joints, and remove any excess with a sponge. Make sure that you use the grout float DIAGONALLY or you will remove grout from the joinsts. Wash the tiles with the sponge to make sure there's no grout on them. A sponge is one of the main tools to have. Always keep a sponge and a bucket of water closeby. You should use sponges to wash cement products frequently, and keep them handy to clean tile or grouts throughout the installation. Be careful... if you start washing the grout off the tiles too soon, you might wash down the joints at the same time. However, if you wait too long, it is even worse: you will have a very hard time cleaning the tiles. The open time for grout depends on the weather. If it's hot and dry, it will set very quickly. When the group feels firm, start washing the tiles to remove any excess grout. Wash over the entire area you tested. Start with small areas to exercise your skills. Allow the floor to sit overnight before grouting. You have several choices in grout for ceramic tile. See our report on grout types for more info. Generally, sanded grout should be used in grout joints 1/8 inch or larger and unsanded grout should be used in joints less than 1/8 inch. When purchasing grout make sure to buy enough to cover the entire project. It is a good idea to buy extra for repairs later. See diagram # for estimating how much grout to purchase. Mix the grout in a small bucket. Add the powder first and then add water to the bucket and stir with a wooded stick. Do not use a paint mixer attached to a drill to stir. This is too fast and will create air bubbles in the grout. If your're using a latex or acrylic additive, please read the directions on the bottle carefully. Some of these admixtures are used with no water. Mix the grout into a thick yogurt like consistency. Allow this mixture to sit for ten minutes and recheck to make sure it is still soupy. If not, add more water or additive. 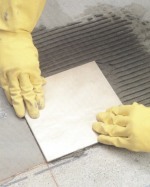 To grout the ceramic tile, you will need a grout float. Take a glob of grout and spread it over the grout lines. Push the grout into the open lines working it in thoroughly. 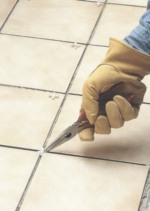 Remove any excess by holding the grout float at 45 degree angle and running the float across the tile. Work in small sections at a time. Remove excess grout with a clean, damp sponge, making sure not to use too much water. Excess water will wash the grout out of the joints. Wait about 10 minutes for the grout to set up and then re-wash with a clean sponge. Once the grouting job is complete, re-wash again. Tip: Removing excess grout can be a problem The trick to removal is to frequently rinse your sponge, making sure to use plenty of clean water. To avoid numerous trips to the sink, have several buckets of clean water ready to go. The grout should be sealed, but it is best to wait at least 10 days before applying a sealer.